The TSN-883 Angled 88mm Prominar Spotting Scope is a world-class spotter that redefines the standards of color brilliance, sharpness, and brightness. The TSN-883 uses an element of PFC (Pure Flourite Crystal) glass in its construction, which greatly minimizes chromatic aberration. This ensures maximum efficiency in its light gathering, producing a clear visual range and sharp imagery that traditional glass lenses cannot attain at their highest magnifications and with the strongest of subject/background contrast changes. Flourite is extremely expensive, but the subtle difference between the viewing from the Prominar-equipped TSN-883 and even the very best normal scopes would be apparent even to a novice. Kowa's use of their patented "C3" prism multicoating process increases image brightness significantly over their prior-generation models which featured flourite. The 883's housing is made of a magnesium alloy that defines maximum durability and lightweight construction, resulting is a compact, ergonomic, and functional design for extreme nature and outdoor enthusiasts wanting only the very best. It sets a benchmark for the combination of large objective with small weight and mass. 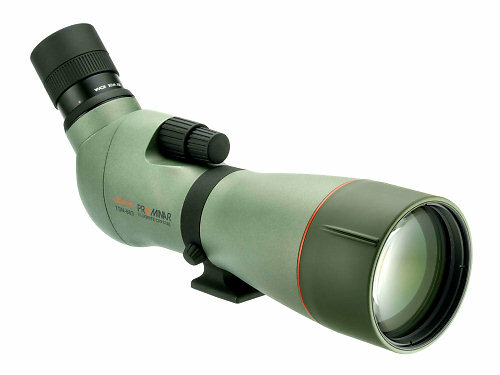 As the angled viewing model of Kowa's flagship line, this scope makes sharing the viewing amongst multiple observers quite easy and is also generally considered more comfortable for longer glassing sessions. An angled scope allows for a slightly smaller, shorter tripod, and requires a bit more experience to quickly locate the subject in the scope.